The texts of Diogenes of Oinoanda (2nd century AD) who invited his readers to an Epicurean life is the largest ancient inscription ever discovered. Over 70 new finds have increased the number of known wall blocks and fragments to nearly 300, offering new insights into Diogenes’ distinctive presentation of philosophy. 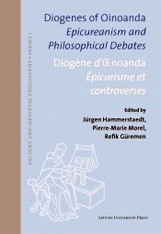 This collection of essays discusses the philosophical significance of these discoveries and is the first of this kind entirely devoted to Diogenes of Oinoanda. Particular attention is paid to his philosophical aims and polemical strategies. Diogenes was apparently well aware of still ongoing philosophical debates, engaging in polemics against Presocratic philosophers, Platonics, and especially Stoics. His views about important issues like happiness, fear, old age, and the afterlife are explained on the bases of Epicurean physics and theology, ethics, politics, theory of knowledge, and psychology.